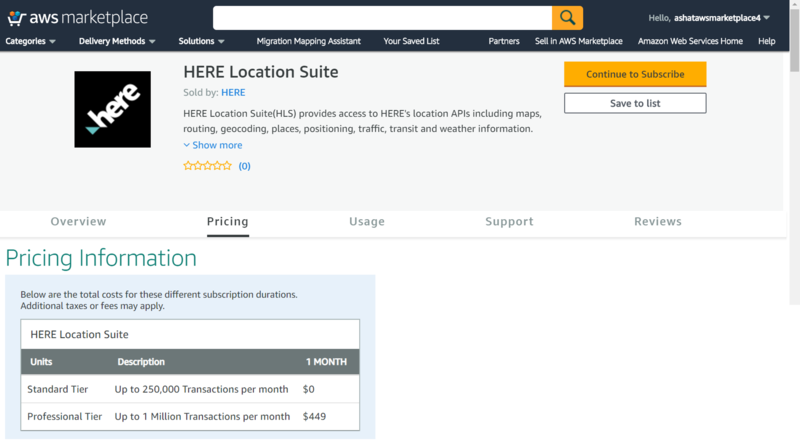 Amazon Web Services Marketplace now offers best in class location APIs and services thanks to the HERE Location Suite. 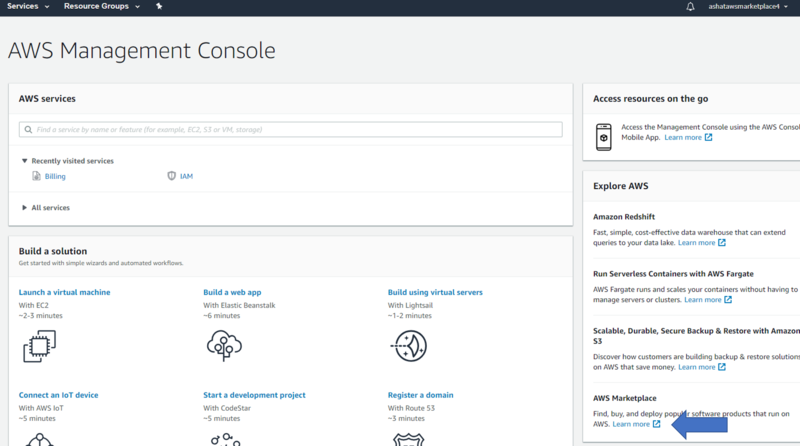 As a developer, you can log in and start using our platform directly within the AWS environment using your existing AWS account. The FREE Standard tier gives you 250K monthly transactions that can be used across any of our APIs in any environment. Whenever you feel the need, you can upgrade to the paid Professional tier with a few clicks and get 1M transactions every month across all offered APIs. Once you are signed up for an AWS account or logged in to your existing account, from your AWS Console find the link to the AWS Marketplace or go to the AWS Marketplace and login with your AWS account. Simply start by searching for the HERE Location Suite. Click Continue to Subscribe and select the Standard or Professional tier on this page. Once you select your options and proceed, you will be redirected to setup your developer account with HERE or use your existing HERE developer portal account if you already have one. This account will let you login to our AWS Subscription management portal to retrieve your API Credentials at any time, view transaction consumption reports and more. This email address will also receive notifications in case you are approaching your subscription transaction limits so that you can take appropriate action. You can login to the HERE AWS Subscription management portal at any time to retrieve your APPID and APPCODE securely. These are two random strings that serve as API access credentials. At this point you are ready to invoke our APIs from your applications using the APPID and APPCODE. You can always get more details about the APIs from the Documentation tab and excellent technical support from HERE’s location experts and fellow developers like you is available on Stackoverflow. Oh and one more thing, notice the Resources tab at the top? This is where we have a few interesting tutorials to get you started. Whether you are an Alexa developer looking to add location to your Alexa skills, or wanting to make location aware Lex chatbots for internal or external customer service or an IoT developer looking add location awareness to non-GPS devices or wanting to build and deploy location aware Machine Learning models -- there is something in these tutorials for you. We will be constantly adding new tutorials and blogs, so keep watching this space! Happy coding and we look forward to hearing what you built with AWS and the HERE Location suite on marketplace! Map Tile: Shows fresh day-time map tiles in multiple styles with rendered live-traffic tiles. Map Image: Access pre-rendered map images optimized for desktop and mobile devices. Venue Maps: Get venue maps through image tiles or/in JSON format. Routing: Get precise instructions to a destination using various transport modes, leveraging different algorithms. Geocoder: Convert street addresses to coordinates and vice-versa with batch, auto-correction processing. Places: Allow your users to search, discover and interact with Points of Interest. 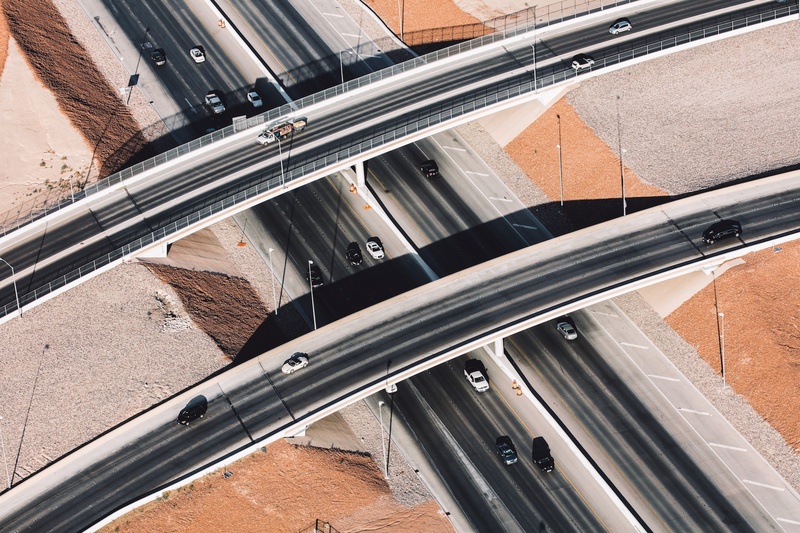 Traffic: Access real-time traffic flow incident data in XML and JSON. Weather: Show real-time weather astronomical forecasts. Transit: Access transmit routing features like search, next departure and access points. Intermodal Routing: Get alternative routes with drive, park, ride an walk to final destination. Positioning: Provide positioning estimates based on global Wi-Fi and cell coverage.